Healthy eating and exercise habits are usually on auto-pilot throughout the workweek, but Friday comes around and many of us tend to let loose by having one too many cocktails, indulging in brunch or other restaurant meals, sleeping in and skipping our workouts. Sound like you? 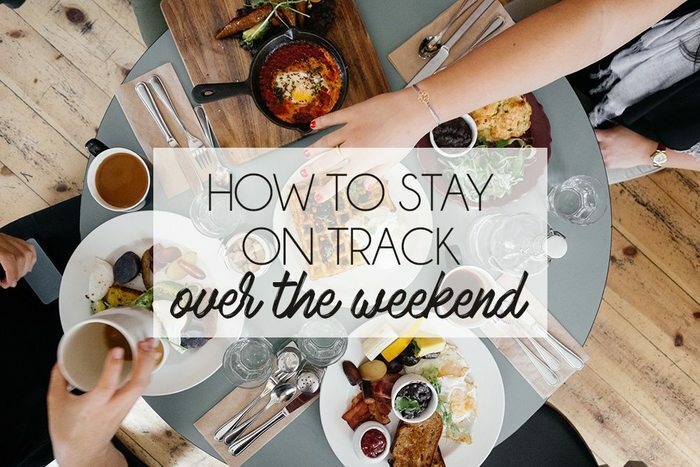 Here are my best tips for how to stay on track over the weekend! For most people it’s pretty easy to stick with healthy eating and a structured workout routine during the workweek, but for whatever reason the weekends throw us for a loop. When I got back to the office on Monday after an indulgent weekend at the beach, I commiserated with two of my co-workers (who are both trying to lose weight) about how weekends can really set us back on our fitness goals. If you add up all the weekend days in a month (counting Friday, Saturday & Sunday) it’s about 12 days, which is almost HALF OF THE MONTH. So taking off on the weekends means you’re literally taking off 50% of the time, which isn’t ideal if you have a goal set to lose weight or get in shape. I’m not saying that there isn’t room for some splurges and treats, but it’s important to keep your health goals in mind when making choices over the weekend. 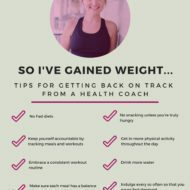 Since it is Friday and this is weighing (pun intended) heavy on my mind I thought I would share a few tips for how to stay on track over the weekend… while still enjoying yourself. Stay focused and keep with your normal routine – One of the big things that throws us off on the weekend is lack of routine or structure. If that’s the case for you, come up with a weekend routine. Of course, there will be weekends where you don’t follow the routine exactly, but it can be so helpful to add some structure to your weekends. A few ideas: plan to take a specific group fitness class every Saturday morning, have family dinner and board game night on Saturday, carve out a few hours every Sunday for meal prep, have a set time for dinner and go to bed at the same time you normally do during the week. Limit your alcohol – A lot of people use alcohol as a way to relax and socialize on the weekends. Having a drink here and there is totally fine, but it’s super important to find other ways to relax and decompress. A few ideas: exercise, catch up with an old friend, read a book at a cozy coffee shop, take a bath, schedule a manicure or a massage. Of course if you do plan to indulge in a few alcoholic beverages, it’s best to drink water or another calorie-free beverage between drinks and don’t get so tipsy that you throw caution to the wind about what’s going into your mouth. I know we all hate this one, but it’s true: studies show that one of the top sources of extra weekend calories is alcohol, so it pays to scale back. Eat a healthy breakfast – This is one of my favorite tips for any day of the week! A healthy breakfast starts your metabolism, helps to control your appetite all day and sets the foundation for how the rest of the day will play out. Some healthy, but fun weekend breakfast recipes to try: almond butter stuffed french toast, caramelized onion and red pepper frittata, apple cinnamon baked steel cut oatmeal. Stick with the basics – When planning meals for the weekend (whether you’re at home or at a restaurant) load your plate with lean protein, healthy fats, whole grains and lots of fruit and veggies so that you feel satisfied. Many people tend to graze throughout the weekend rather than sitting down for full meals. This practice is fine for some people, but it easily leads to overeating for most! Be smart when dining out – If you eat out on the weekends, look at the menu for the restaurant online before you go so you can see what healthy options they offer and decide ahead of time what you’re going to order. Other healthful tips include skipping the bread basket, starting with a salad or soup, and either splitting your main entrée or packing up half of it to take home for another meal. Keep a food journal – This is another one of my favorite tips. Writing down what you eat is the most accurate way to hold yourself accountable and ensure you’re not sabotaging your diet over the weekend. All those small bites and sips that you quickly forget about add up! Find healthy ways to indulge – Do you crave pizza every Friday night? No worries, you can make a healthy version, like this cauliflower pizza or these portobello pizzas. 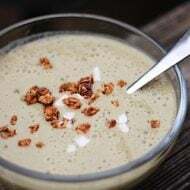 The same goes for desserts… try these avocado truffles, healthy no bake cookies or this chocolate banana ice cream if you need a chocolate treat. Take advantage of weekend farmers markets – I might be a dork, but going to the farmers market on Saturday morning with Isaac and Olive is one of my weekend highlights. Farmers markets are normally filled with healthy food choices and make for a fun weekend activity. Beware of free food – Often times free food (like pizza and cake at a birthday party or random grocery store samples) can sabotage your efforts to cut out the junk food and sidetrack your goal to make healthier choices. For whatever reason we feel this intense need to eat it because it’s free! By only eating food you buy for yourself, it will help you stay clear of the temptations. Sometimes I’m a sucker for the free samples at Whole Foods, but overall it’s best to avoid them. Most of the time they aren’t the healthiest of foods and who knows how long they’ve been sitting out or how many people have touched them. When you think about it this way, the free food is way less appetizing. Move more – Make the most of the extra free time you have on the weekend and try to squeeze in some sort of workout or physical activity. Getting your friends and family involved in something outdoors can be a fun way to get moving! And remember, exercise doesn’t have to mean going to the gym — walking, hiking, playing sports, gardening, cleaning the house and mowing the grass are all forms of physical activity. Use your weekend to plan for the week ahead – The weekends are a great time to plan your healthy meals for the week ahead. 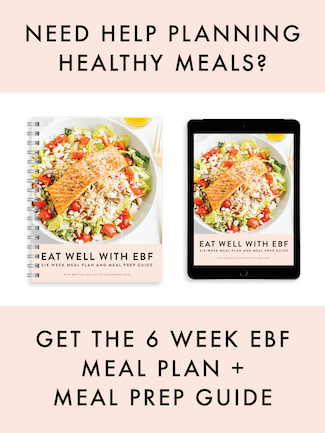 Use this meal planning printable, go to the store to get your groceries and do a little meal prep so you’re ready to go on Monday! Moderation is key – Eat and enjoy your favorite foods in moderation. Deprivation tends to backfire so if you really want a treat, eat and enjoy it and then move on. Last but not least, don’t let one setback keep you from working toward your health goals. If you slip-up over the weekend, don’t let it get you down or bring on the mindset of saying I’ve already screwed up, might as well toss in the towel for this weekend start again on Monday. Nope! Just make sure your next meal is a healthy one and keep on going. Do you have trouble sticking with your goals during the weekend? What are some of your favorite tips to stay on track? I never like to feel deprived, especially in the summer when there are so many fantastic weekend activities! I tend to try to preplan and “make it count.” So if I know we will be day drinking or going to a big patio dinner/bbq I make an effort to load up on water and produce the day before, then the day of I make a point to have my typical healthy breakfast (lately, Greek yogurt, berries, chias, honey, and a scoop of pb) and a healthy lunch… then give myself the rest of the day “off.” Which doesn’t mean getting Thanksgiving full, but not being mad at myself if I decide to have drinks, dessert, and potato salad. I have been keeping food journal and its made it abundantly clear that I do great during the week, dare I say – perfect. But I have been spending the weekends at my boyfriend’s parents house – and his siblings home from college along with his parents have the worst eating habits – comfort food like heavy lasagnas, pastas, steak, mayo-based casseroles – and absolutely zero vegetables and fruits. They just don’t eat them! (Bizarr-o…) Its really tough to make healthy choices and at the same time not insult their mother’s cooking – one of those environments where if you don’t have 2 heaping plates full it means there is something wrong with the food. I’ve started to bring my own healthy snacks over and downsize my portions but I cannot wait for Mondays to come and I can go back to my own house and eat my normal health-ful food!! I really needed this post. I have the worst time on the weekends. I feel like I sabotage my weeks work on them. Everything you said is great and I just hope I can take it to heart and actually DO it. This weekend, I’ve got a big half marathon so it might be easier to stay on track but as for the rest of them….thanks for the post. It’s so helpful. I am always afraid of all the bbq/parties on the weekends that I won’t stick only with the healthy food. I am going to the wedding tomorrow and I am already stressing out what they will serve there…Thanks!!! My problem on the weekend (besides wine and cocktails!) is that I’m not on a normal eating schedule like during the week (breakfast before work, lunch at work, dinner when I get home) so I tend to snack throughout the day instead of making actual meals. I’ve been keeping healthier snacks in the house for that reason. I’m also a big fan of splitting an appetizer and entree with someone when we eat out, saves money and calories! I feel ya lady! My ankle has put a damper on my workout routine. :/ I think we’re going to go to Broad Appetite around 1. I totally sabotaged myself last weekend. I ate some junk and totally gave up and was bummed about it. Even though I know I will be eating badly again this weekend, I am taking this to heart. “Just make sure your next meal is a healthy one and keep on trucking.” Thanks for this post! These are SUCH great tips!!! It’s so true that it’s 10x harder for me on the weekends. I think that’s partly because so many of my weekend activities revolve around food (happy hours, dinners, ice cream… oh goodness, haha). I’ve been trying to get out of the “all or nothing” approach. A lot of times I’m like “Well I’ve had 3 glasses of wine, I might as well eat that whole bag of tortilla chips now…” rather than just enjoying those 3 glasses of wine, not feeling guilty, and staying moderately on track. You know?? Great tips! I find I am the opposite most of the time – it’s office temptations that derail me during the week and I can be perfect on the weekend. It makes no sense whatsoever! Of course, if we have friends over or go to visit them then any plan to eat healthily tends to fly right out the window! I like to eat Turkey burgers….is there a recipe from you or your friends that I can use specifically in my diet? My Mom and I are dieting now. Hey Laura. I’m sorry, I don’t have a turkey burger recipe. I’m sure you could do a quick google search and find some good ones. I also bet cleaneating.com has a recipe for them. These are all great suggestions, and you’re totally right about not letting one setback (or perceived setback) totally derail your future efforts at maintaining a healthy lifestyle and keeping your eyes on the proverbial prize. One meal doesn’t matter, one day doesn’t matter: Just pick back up where you left off, and start fresh tomorrow. Weekends don’t tend to be terribly different for me than weekdays: I still manage to cook most of our meals at home, work out regularly, and focus on whole foods and lean protein — but everybody gets to cut loose every once in a while! My strategy is to never do anything I might “regret” later — I find that people who joke about how “naughty” they are on the weekends feel worse about themselves than others, and waste emotional energy “making up” for their indulgence, or beating themselves up over it. You want a cookie or a glass of wine? Check in with yourself first: If you fear you’ll regret it later, consider passing this time. But if you think you can enjoy it for its own sake, and not feel unsatisfied or unsettled afterward, go on ahead! Weekends are so hard for me. I’ve got my weekdays dialed but then the weekend comes around and it’s drinks with friends, a wedding, a baby shower, dinner out, pizza and a movie… and I feel like I throw all the work I’d done during the week out the window. I’m trying to limit my alcohol and I’m hoping that will keep everything a little more balanced. The more drinks I have, the more likely I am to make bad food choices. I’m going to try and limit myself to 3 drinks a weekend. We’ll see how it goes. Great tips! I need to stay on track by getting in more exercise. I’ve started a June challenge with my hubby, to eat right and workout for the whole month. We are both trying to make it a habit to be healthier. Thanks for posting Brittany. I just came back from an indulgent couple of days at the beach as well, and although I know it is normal to splurge every now and then, I tend to beat myself up (especially if I don’t watch my alcohol intake! That always gets me). That is something I need to work on because usually I have no trouble staying active and eating healthy on the weekends. Also, I’ve never really had a huge problem with weekends. I don’t really see them as ‘breaks’ from eating well! But, everyone is different. I was just wondering how you’re enjoying the new ToneItUp diet plan? I’ve just started following it and I love it. If you haven’t yet, I’d recommend ordering their new DVD. It’s kick rump! I’m loving the new ToneItUp Diet Plan and I definitely want to check out the new DVD!! I’m probably going to review the work outs on my blog tomorrow as I’ve just gotten around to trying them all, if you want to check that out! Fan of yoga? If so, you’ll love it! You can see how the girls let classic yoga postures inspire the routines! It’s lovely! This is a great list of tips, and so timely at the beginning of food festival season! I am so looking forward to the Vegetarian Festival in a few weeks, and I bet it will be easier to make healthy choices there than it is at most festivals. So true. I always feel like I sabotage myself over the weekends for the exact same reasons that you mentioned. Glad to know I’m not the only one – and the TIU girls advice that weekends are half of the month blew my mind! Need to stay focused to stay on goal. LOVE THIS POST because it is so true. I try to stay on track with all the recommendations that you stated. Your blog has been one of the blogs that inspired me to start my own. I started one to motivate myself and hopefully others! Please feel free to check me out everybody! I just found your blog and am looking back through old posts. This one particularly speaks to me…I’ve been dreading this weekend because we have a wedding and two parties to attend. My routine during the week is so good, I just need to remember I can also stick with it over the weekend!